6 Where's the discussion block? This comic is an animation, which was showing a new image every hour. In the beginning the interval was only half an hour. The unfolding story is set in the far future, at a time when the Strait of Gibraltar has long been blocked and the Mediterranean Sea has largely dried up leaving smaller, hypersaline seas behind. Megan and Cueball, living on the shores of one of these seas and unaware of its natural history, notice one day while building a huge sand castle on the beach that the sea level is starting to rise. They start a journey of exploration trying to find out why. Eventually they discover that the Straits of Gibraltar have once again been breached, and that the Mediterranean Basin is being flooded. They run back to their home, assemble the people of their village, and board a makeshift raft. At the end they reach land with their rafts, searching for a new home. On frame 2925 the title text changed from "Wait for it." to "...", and one frame later to just "RUN.". At approximately 2944, when Megan announces that it is too late to escape overland, the title text changed back to "...". On Frame 3094, the words THE END appear in the middle of the screen and the title text changed to "The end.". The image now links to the scrollable collection of frames at geekwagon.net/projects/xkcd1190/. The comic on xkcd.com today currently loops through the last five frames of the comic. This comic now has its own article on Wikipedia. This comic won the 2014 Hugo Award for Best Graphic Story. This comic is actually a series of images which play as a rough animation. The pictures were updated over the course of time. The comic ran for 2973 hours (over 124 days) and consists of 3101 image frames. For the first 120 hours, a new frame replaced the previous frame every 30 minutes, at :00 and :30 of each hour; the remaining frames have since been revealed every hour. The update was done server-side, with the server redirecting the image link (time.png) to a different image every hour. The source images have very long random hash names, which made it virtually impossible to access future frames. There is no way to view past frames on the official xkcd website, and only the current frame is posted there at any given time. Given the unique nature of this comic, the full image archives can be browsed through several websites that have been dedicated to tracking it (see below). Readers typically have divided the comic into four scenes (see below). For example, at 850 hours (36 days 10 hours) the first "scene" of the comic ended at frame 971 with a fade to white, ushering in a second scene from frame 972. Some of the last few frames of scene 1 are nearly white, but faint images can be seen in the normalized pictures available below (Day 36, Monday, April 29, 2013, normalized). Megan and Cueball are alone on a sandy beach near the sea. They begin to build a sand castle on the beach. The two continue to expand the castle back from the seashore as the scene zooms out. Briefly they have fun launching small objects at the castle with a trebuchet before continuing the build. Both Cueball and Megan each leave the scene for extended periods at times but always return to continue building. They add what appears to be scaffolding and ladders to expand the castle skyward. All the while, Cueball and Megan wax philosophically about the nature of the sea, the feeding river, the rising tides, and what else lies in the world. In the end, the two decide to go off and explore the world as the sea begins to erode the castle and the scene fades to white. One other character appears during the fade; A girl with a beret, similar to Beret Guy, briefly appears to view the castle before leaving. She returns in the last two frames before the fade-to-white completes, dragging something. Cueball and Megan are walking with bags across a relatively level surface. The terrain looks like frame 1, albeit from a wider angle, showing they are walking along the coast. The scene shifts multiple times between views of them to the left of the sea, and 90° rotated views of them walking overland. Sometimes these shifts in angle are marked by corresponding shifts between front and profile views of their bodies. Megan indicates she has never been so far "this way". They reach a river they haven't seen before. Cueball slips in and loses his bottle. He contemplates swimming out to get it, but Megan says it is too dangerous. Later when Megan gets too close to the edge, Cueball senses danger and pulls her back. After a small talk both agree to find a ford. After walking for a while, Megan realizes that the river was wider than they realized. The branch of the river they were walking along joins up with another branch and the opposite bank eventually comes into view. They stop for a break and Cueball dozes off and mumbles in his sleep. They discuss this river and the differences between it and theirs before continuing upriver. The terrain begins to slope noticeably uphill. They wonder if others have noticed the rise of the sea and find tents left by other people. They walk deeper into the dunes, having fun by jumping and sliding. Megan falls after jumping too high. A bird appears in the sky. They watch it until it's gone, then begin walking again. Some vegetation appears, grass and then small trees. They stop and nap beneath a larger tree, seeming to have never seen one like it before. After a rest Cueball goes off to explore. He picks some berries and examines a campfire pit, then walks back to Megan and shares his findings. They wonder why the prior owners of the tent have left. They stop at the river to drink, then climb a ridge, and are awestruck by two tall trees. As they walk through the trees, the first large tree has markings on the trunk and the fourth large tree has a strangely bent top. They comment on these features before they continue on past three more huge trees and a regular-sized one. They enter a vineyard and eat some grapes. The two travel on. Cueball encounters a snake while climbing a small cliff and falls back. They find another section of the cliff and continue. After that they reach a tree with a nest in it with a young baby bird crying for its food. The bird's mother feeds it, then Cueball takes a short nap while Megan investigates a small river. The pair continue to climb the mountain, commenting here and there on the possibility of turning back, but Megan wants to see what's at the top. Eventually, they stumble upon a small shelter and a few other signs of inhabitants. They investigate the surrounding area. A cougar attacks Megan, but Cueball gets in the way - although not before it claws her leg. Most of the hit gets absorbed by his backpack, but Cueball is forced to the ground. Megan grabs a stick and attacks the large cat, which runs away. Megan decides she would like to press on despite her injuries. Cueball and Megan then take turns sleeping as night arrives. Cueball takes the first watch. While Megan sleeps a meteor appears in the sky. Then Megan takes the next watch. When Cueball wakes up, they start their journey again up the mountain, which is slower due to Megan's injuries as Cueball has to help her over some of the steeper climbs. After they reach a plateau there is a tower. Megan climbs up and sees other people. Cueball is curious and climbs the tower too. On top of that tower Megan remarks her wound doesn't hurt much when walking but it does when she climbs. Then, they continue their travel at the plateau. They run into three people who speak a language that they are unable to understand. Despite the language barrier, Megan shows her wounded leg and the strangers proceed to take a closer look at her. The strangers then help her to sit down on a stone. After the stranger with the medical equipment is back they do some kind of first aid. Megan expresses her thanks, and the strangers indicate via drawings in the sand that they should follow. After walking uphill again they approach another tower. A device is mounted to the top and more smaller devices are around. They drink some water there and Cueball learns his first word in this new language: "water" or "drink". To aid communication, they start to draw pictures on the ground. Cueball shows their travel from the sea to the current location, and the stranger adds the rising sea level, indicating that he knows about this happening. The stranger shows a castle some more uphill and a long haired woman behind it. Cueball hopes they can speak to her, and the stranger explains with a drawing that it's less than a day away. The strangers collect their devices and store them somewhere. Then they start the travel to the castle. When they rest, Megan and Cueball taste some food offered by the strangers; they like it. A large flag appears and they encounter a small city. A big castle, still under construction, is visible in front of them. Megan states that she never thought she would ever see a real castle. On their way to the castle they meet another stranger, exchanging some greetings. Then they enter the castle. The five people walk down a stairway and enter a large hall. Large windows showing a dazzling light are high above them. They approach a long-haired woman at a desk who greets them. After Cueball asks, it appears she can "somewhat" understand him and Megan. The woman asks where they came from and asks about their home; she asks if they brought anyone else. Megan and Cueball say they're trying to find out why the sea is changing. The woman explains that there is another sea which was once connected to theirs, but has since been cut off. She says that the water is now flowing back into their sea, and that the level will continue to rise. She shows Megan and Cueball a map of the area, including the castle, their sea, and the bigger sea which is joining it. The woman then shows the predicted new shoreline, which closely resembles that of the Mediterranean Sea. Megan assumes that the level rise is slow and will last for some years. The woman disagrees, and explains that the water level will rise over the course of a few days. Faced with knowledge of the imminent destruction of their village, Megan and Cueball bolt from the room and begin to run. They leave the castle and run back the same way as they came. They encounter some people on their way out. By this time the title text has changed from 'Wait for it' to '...' to 'RUN.' They pass some more people they met before and when they are alone, Megan reveals that she has stolen the maps from the long-haired woman. Megan hopes she can give them back sometime. Cueball is happy and they continue their journey by using the maps. They reach their village, where they find that the people are aware of the rising sea levels, and that some of them have already gone up into the now-abandoned hills to see what items were left behind. Megan and Cueball tell them that the sea will continue to rise, and they make preparations to evacuate uphill. It turns out that Beret Girl from before has turned Megan and Cueball's sandcastle into a boat. Megan has the idea to ride it on the rising waters, but they need to hurry to prepare it. The raft is hastily made seaworthy and the tribe goes off in pursuit of the rest. They find the others floating on a makeshift canoe from a piece of floating debris. A rope is thrown and the two boats try to pull each other closer. At one point the boats bump into each other and everyone falls over. A new day arises and as Cueball and Megan rebuild their sandcastle on top of the raft, the raft runs aground. The tribe rushes off to explore the new land, and the raft is left behind at the end of the story at the mercy of the wind and waves. A scrollable version is at geekwagon.net/projects/xkcd1190/ (with code on github), this is now being linked to from the comic's site. There is also a map with guesses on the locations that Megan and Cueball visit. Another map of estimated travel paths with terrain data is here: TimeTerrainMap.png. Additional composite scenes are located here: 1190: Time: Pictures. Some of the images are very large, and may be slow to load. Investigations on the blurry speech by the woman in the big castle at scene 3 part 3 are here: 1190: Time: Translator. Please help to enhance the pictures there for better readings. On July 29, 2013 Randall did a post at his blag about this comic. 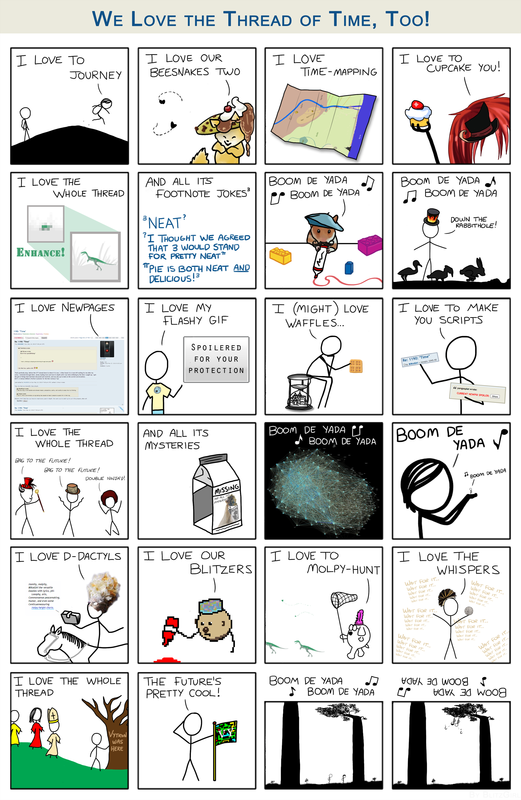 In the xkcd fora, this comic was given a thread like any other comic. The Time thread expanded over the months of the comic's running to include 1254 pages, or just over 50,000 posts, and continued thereafter at a considerable pace. As of August 23, 2018, it has over 106,000 posts and an enormous 38,000,000 views, which easily tops every other thread, while still being quite active. 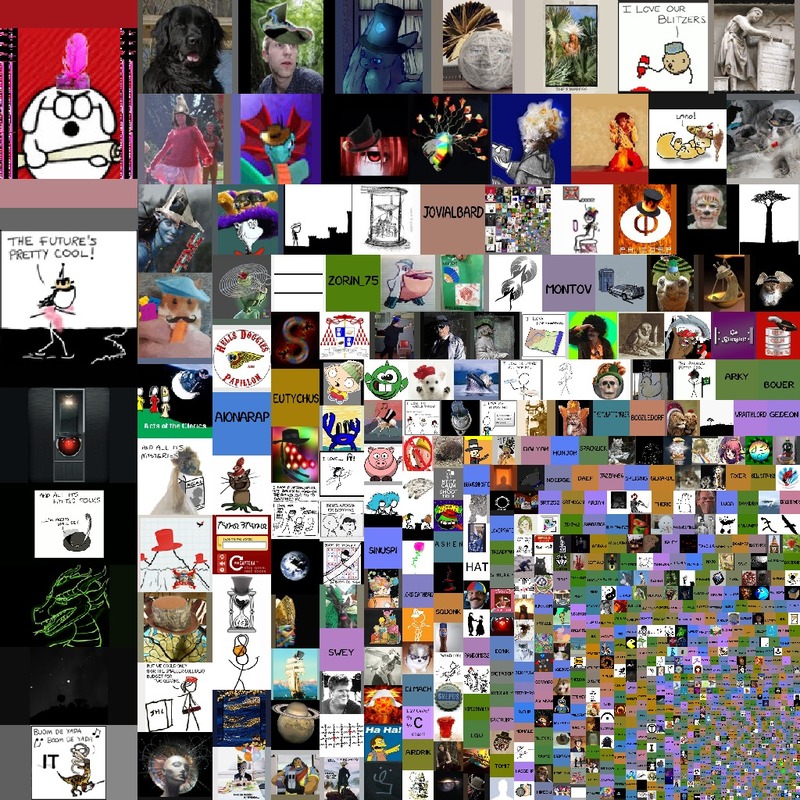 More than 1/3 of all posts within the Individual XKCD Comic Threads subforum are in the 1190: "Time" thread. Compared to the thread for Click and Drag, it has over 50 times as many views and 150 times as many posts, while the typical comic thread has 30 to 200 posts. Its activity as a percentage of the entire fora can be seen in this graph. The many frequent posters of the thread developed a culture surrounding Time, creating their own mannerisms, vocabulary, and jokes on top of extracting every detail from the comic and recording every frame. More information can be found at different places on Time's dedicated wiki, or, of course, on the thread itself. Megan: Just got some in my mouth. Megan: Any idea where the river is now? Cueball: Still pretty far out. It's actually retreated a little this week. Megan: I don't understand what the sea is doing. Cueball: I don't think we can build it much taller than this. It's been fun, though! Cueball: Guess one of us should climb down. Megan: The sea is rising. Cueball: Sea level rises and falls, right? It's changed before. Cueball: The river hasn't even reached the sea yet. Megan: Does it rain on the sea? Cueball: If it does, it seems like a waste. Cueball: It rains in the hills where the river comes from, right? Cueball: Are there other rivers? Cueball: There must be other rivers. Otherwise the sea would dry up. Megan: Maybe it's coming out of the ground. Megan: I don't know how the sea works. Cueball: I don't know how anything works. Megan: I don't think it's going to stop. Cueball: The sea can't just make more of itself forever. Megan: It can do whatever it wants. It's the sea. Cueball: There must be a reason. There's a reason for everything. Megan: But it's not always a good reason. Cueball: There must be other rivers. Maybe something is wrong with them. Megan: I like our castle. Cueball: I think it's going to go away. Megan: Do you think there are other rivers? Cueball: Something is adding water to the sea. Megan: Does it have to be water? Maybe something is adding more land somewhere. And it's making the sea overflow. Cueball: Or maybe it's just raining somewhere. We have no idea what's out there. Megan: Want to find out? Megan: I'll get some bags. Cueball: Have you ever been this far? Megan: Maybe the sea doesn't end. Cueball: We haven't walked very far. Megan: But that's what the first part of not ending looks like. Megan: If we don't find something today, we'll have to start using the steam bottle. Megan: There are other rivers. Megan: It's ok. It was an accident. Megan: The river's not moving very fast. Megan: It can't be flowing much faster than we walk. Megan: Even if it's as deep as it is wide, I don't think it's enough water. Cueball: And this river doesn't look broken. Cueball: It's pretty neat, though. Cueball: It's strange - Rivers flow to meet the sea - Maybe the sea couldn't wait. Megan: Walk upriver to find a ford, or turn back? Cueball: But that's what the first part of understanding everything looks like. Cueball: If nothing else, I'm glad we found this river. It's not much farther from home than ours at its driest. Megan: Oh. This river is even bigger than it looked. Megan: Maybe it is big enough to fill the sea. Cueball (talking in his sleep): Our rope isn't strong enough. Cueball (talking in his sleep): Hold this or you'll fall. Cueball: When our river gets too big, it fills with stuff. Wood and leaves and things from the people in the hills. Cueball: This river doesn't look like that. Megan: Maybe it only flows through empty places. Megan: If this river isn't what's making the sea rise, we need to get past it. Either way, we continue upriver. Megan: I wonder how high the water is now. Cueball: I wonder if other people have noticed. It's been days. Megan: Not a lot of us by the shore this time of year. Megan: It'd have to rise a lot higher before any tents got wet. Cueball: This river flows from bigger hills than ours. Megan: If we don't reach a crossing soon, we'll be in them. Megan: I wonder if it's possible to swim in. Megan: Should we follow the river through there? Cueball: Let's see if we can go over those and rejoin it further up. Megan: It must get windier up here. Megan: These are bigger than they looked. Cueball: There are people here. I found some sort of campsite. Cueball: Looked like it'd been empty for a while. Megan: I'm thirsty. Let's get to the river. Megan: They leave anything good behind? Cueball: Just some wood. Not enough to build a raft. Cueball: This place is beautiful. Megan: I am surprised we haven't been seen by any people yet. Megan: If it's this empty, we should live here. Cueball: Did you notice the sea tasting better? I try not to taste seawater. If a river is putting too much water in the sea, the sea should get fresher. Cueball: I tasted the water back before we left. Cueball: I thought it was a little fresher, but maybe it was just me. Megan: Probably. I mean, how high was the sea then? The extra water couldn't have been more than a tiny part of it. Cueball: Well, we may as well continue. Megan: Is this like the one you found? Cueball: There are markings on the trunk. Megan: I wonder what they mean. Megan: I wonder if it's supposed to be like that. Cueball: It's a pretty big tree. It probably knows what it's doing. Cueball: Do you think it's ok to take some? It doesn't look like anyone's been here for a while. Cueball: This looks like the stuff that floats down our river. Cueball: I wonder if these people are related to the people in the hills. Megan: But the markings on that tree didn't look familiar. Megan: We could cross the river now. We've found more than enough wood for a raft. Cueball: We're almost in the mountains. Cueball: We walked along the sea for days and we didn't learn anything. Up here we're learning lots. Megan: We haven't learned why the sea rose. Cueball: Maybe we were never going to. Cueball: There's food and water here. I don't want to go all the way back down, walk along the sea for a few more days, then have to turn around. Cueball: Maybe the sea is too big for us to understand. We can't answer every question. Megan: No, but I think we can answer any question. Megan: Still, I agree. No need to turn around yet. Megan: And those mountains do look neat. Megan: Before we go, we should stock up. Cueball: I'll get more water. Megan: It's ok! I won't eat you. Cueball: I wonder where the people who take care of these plants are. Megan: What are you doing? Cueball: Making shapes with my shadow! Megan: When I stare down at mine for long enough while I walk, it starts to look really weird. walking straight into the sun all morning. Cueball: It's prettier right by the river, but it's easier to walk up here. Megan: Well, it all gets greener further up. Megan: Did it bite you? Megan: Could you see what kind it was? Megan: Did it have little spikes over its eyes? Cueball: No, not one of those. Like it forgot to have a head and tail. But let's go around. And watch your feet. Megan: I think I can almost see the sea from here. It's hard to tell what's land and what's sky. Megan: It's cooler up here. Cueball: Are you hearing quiet chirps? Cueball: I don't hear it now either. Megan: I heard chirps from the night sky once. Megan: I was looking at the stars one night and I heard peeping. Just a single chirp now and then. Cueball: Did you see anything? Megan: I thought a few stars flicker. - Nothing else. Cueball: It's coming from up ahead. Megan: Why is it doing that? Megan: I guess it's angry that we're here. Cueball: I think it gave it something. I bet the loud one is a baby. Cueball: Now they're both loud. We are not going to eat your baby. Cueball: I don't think it believes you. Megan: That's ok. It's just protecting its baby. I think I see water up ahead. Megan: I found a tiny river. Megan: Come see what I found! Megan: This river is flowing toward the big one, so I followed it to see if they connected. Cueball: I guess the land goes up, but the river stays at the same level. Megan: The river has been going up, too. But not as fast as the land. Megan: Can water really wear away rock like this? Cueball: I guess it can. Megan: I can't imagine how long it must have taken. Cueball: A lot of these rocks are pretty crumbly. Cueball: Even down there, between all the big rocks, the cliff walls look sandy. Water eats away sand pretty fast. Megan: I wonder how deep it gets. Cueball: Maybe it goes right through the mountain, and it's as deep as the mountain is tall. Megan: It could be even deeper. We don't know how far down the water goes. Cueball: I guess it can't be much deeper than the surface of the sea. If it were, it wouldn't flow fast and cut into the ground. Megan: But then, a river couldn't cut all the way through a mountain, either. Because how would it get started? Megan: I wonder what the top of a mountain is like? Cueball: It seems we've reached our journey's end. Megan: Want to find an easier spot? Cueball: No, I can do it. Let me help you up first. Cueball: It's a little prickly. Megan: Careful, it might bite. Cueball: Have you seen one before? Cueball: Ok, we'll stop bothering you. Cueball: Maybe it's time to turn around. Cueball: The world is too big. It can go on longer than we can. Cueball: But one day we won't be. And we're a long way from home. Cueball: Earlier, I thought you wanted to turn around and go back to the sea. Megan: I don't want to go back to it. I want to understand it. Cueball: By climbing? The sea is down, not up. Megan: These bugs have such beautiful wings. Megan: You could spend a thousand lifetimes staring at water and sand, thinking as hard as you could, and you'd never guess the world had things like this in it. Megan: I wanna see the top. Cueball: What do think we'll find? Megan: Just some old furniture. Shelves, a broken bowl. Megan: There's a stream back here. Megan: And it almost looks like there's something on top of the mountain. Cueball: I think whoever lived here liked building castles, too. Megan: It didn't bite you? Cueball: It had claws. I saw them. Megan: But you're not bleeding? Cueball: I think it grabbed my bag by mistake. ...You chased it away. Did you hit it? Cueball: You hurt your leg. Megan: Claw marks. I didn't see it hit me. Megan: This is a surprising amount of blood. Cueball: Keep your hand tight over where it's coming out. I'm looking for something to wrap around it. Cueball: I can just tear the bag. Megan: Sorry for ruining your flag. After all, I brought it for you. Megan: I like it so much I'm coloring it a beautiful red. Megan: It's going to be a long walk home. Cueball: Can you even walk? How are you feeling? Megan: It didn't at first. Cueball: I think you're right. There's some kind of structure on the mountain. Megan: I think I can walk OK.
Megan: It hurts, but it doesn't really hurt more when I lean on it. Cueball: That's good, at least. Cueball: But it's a pretty bad cut. It could get a lot worse in the time it takes to walk home. Megan: Do you think we should keep going up? Cueball: We can't be more than a day or so from the top. There may be people there. Megan: Like the people in the hills? Cueball: We're a long way from there. Cueball: We don't know what's past the mountains. If we go up a little more, we'll be able to see. Megan: And if there's no one there, we wont be much farther from home than we are now. Cueball: I'll carry everything in your bag. Mine's torn, anyway. Cueball: You tell me if your leg starts hurting too much. Cueball: I'll step in and help you over. Megan: It's definitely colder up here. Cueball: How are you feeling? Megan: That thing is still out there. +2240:00 The beginning of a sunset. +2252:00 The sky gets darker. Megan: We need to sleep. pausing to sleep wherever we were. Cueball: I'll stay awake while you rest. Megan: I can stay awake. Cueball: No, you need to rest. I'll wake you if I get tired. Megan: Or if something is trying to eat you, and you need me to hit it. Cueball: I stayed awake as long as I could. Can you take over? Cueball: Yeah. How are you feeling? Megan: But I got some rest. Your turn now. Megan: Do you hear that? Cueball: I wonder what they're doing. Cueball: Did I sleep too long? Megan: Not long enough, really. But it's getting late. Megan: OK. We get to the top. We look for people. Megan: If we don't see any, we start back home. Cueball: I wonder what it's for. Cueball: I guess the mountains don't go back down on the other side. But do you see the dust? Megan: And I saw flashes of light. We can reach them tonight. Is walking still not too painful? Megan: Walking is OK. Climbing hurt. Cueball: You could have asked me to climb up here for you. Megan: But I wanted to see. Megan: Have you figured out what that ting is? Cueball: It looks like it's supposed to hold something. Cueball: You can point it at things. Maybe it's a weapon. Megan: But why would there be a weapon way up here? Cueball: Right now you're pointing it at our home. Haven't you launched enough things at our castle? I wonder what's left of it. Cueball: I think that's another tower. Megan: I think so, too. Cueball: Yeah. I just need to rest for a moment. Cueball: I don't know why I'm so out of breath. Megan: I'm feeling it too. Cueball: I wonder if the air up here is different. Cueball: I can see someone on that hill! Cueball: Still too far to hear. Megan: Well, they've seen us. We're from far away, and my leg is hurt. Cueball: They seem to know what they're doing. Cueball: It's some kind of paste. Cueball: How do we talk to them? We can figure this out. Megan: ..We're from the sea. Cueball: I learned a word. I think. Megan: Yes! The sea is rising! Cueball: Why is that happening? Cueball: ...and want us to come, too. Cueball: Oh, speech! There's someone we can talk to? it's less than a day away. Cueball: Then let's do it. Cueball: It's good, whatever it is. Cueball: Is it some kind of map? Megan: I guess. But it's just a jumble of lines. Cueball: Maybe those triangle things are rivers? Cueball: Wow. There's a whole city up there. Cueball: I like these little houses. Megan: A real castle. I never thought I'd see a real castle! Cueball: I wasn't sure there were real castles. Megan: Look at it. It's breathtaking. Megan: Our castle was too small. Megan: Do you understand us? Cueball: I think we understand you, too! Cueball: We came here up the mountain. Megan: We're from the sea. Translator [very blurry]: You arose here from the desert below. Megan: We, um... We don't quite understand that. Translator [very blurry]: I am sorry. Your language is like those spoken by the... difficult... but I learned it. Translator [very blurry]: Please [two phrases overlapping: "have patience" and "be patient"]. Translator [very blurry]: They understand nothing so they will tend to matters. Megan: What do you want our bags for? Translator: Tell me where your home is. Megan: We live by the shore, near a river that flows down to the sea every year. Megan: It's a smaller river-not the one that flows from your land. We collect things that float down it. Cueball: There are people in the hills where our river comes from. Megan: They don't like us. Cueball: There are about forty of us. Translator: ...is forty? [Possibly "How much is forty"] All my numbers are too small. Megan: Um. Four ten times. Five eight times. Megan: No. We came here alone. Megan: We're here to find out why the sea is changing. Translator [very blurry]: You do not know. Cueball: ...did you get that? Megan: No, I think I understood. There's a second sea, a higher one, and its waters have started flowing into ours. Cueball: Why? What connected them? Translator [very blurry]: In time even the hills change. When people first walked and first built [their] cities the seas were joined. But there was a great [illegible] rocks and the passage was closed. Your sea [illegible] with too few rivers. Under the sun it shrank and the water fell. Now the sea has found a way back in. Cueball: ...How different are the seas' heights? How high will the water eventually rise? Should we move our home? Translator: I will build you a map to understanding. Translator: And this. Our belief about the sea's new shore. Megan: The sea can cover mountains? It has happened before. When our parents were learning to walk upright the sea fled and returned. Translator: [Now] it is happening again. Megan: The shoreline goes right through where the castle is. Translator: The castle [fortress] was once an island. We found it and have tried to rebuild it. Translator: I guess [imagine / suppose] it will be an island again. Cueball: Who are you ? Translator: [very blurry] We are tea(che)rs/learners/scholars. This fortress s(wa)r(m)s with tea(ching)/sci(ence)/lea(rn). And I am their teacher/leader/ruler. Megan: I still can't imagine it. Every place we've walked will someday be inside the sea. Megan: We need to get back home. We need to get started on plans to move. Translator: [very blurry] When we discovered the sea was rising under the bank, we tried to shore it up. We tried to re(mo)ve everybody from the basin but we do not know of your group/t(rib)e.
Translator: [very blurry] As the water flows, it widens the breach. The berm is giving way. The sea will rush through in a great torrent. The planet's mightiest river will once again come thundering down the mountainside. Translator: The journey to your land is much too long. I will not send [illegible] only to see them encircled and drowned by the [rising / rushing] tide. But fortune has delivered you from the flood. You did not intend to leave your home forever, but be [thankful / grateful] you left when you did. The ocean (sea) is coming (here). Cueball: I dreamed I woke up in the water. Cueball: I hope they don't mind us taking some of the food and water here. Cueball: Maybe we should have stayed to ask. But I was starting to get a little creeped out. Cueball: Still, maybe they could have helped us find a faster way back. Megan: I did something that was wrong. Cueball: You stole the maps! Megan: I'll give them back some day! I hope. Cueball: This is great! There are so many! Cueball: We must be here, right? So we can follow our old path back down the mountain, then cut across land through the hills. I'm guessing they're empty. It sounds that everyone knew but us. Megan: OK. We can do this, probably. Megan: That stuff they put on my leg worked great. I'm just glad they had it. Megan: Along with the maps I should've stolen a guide to treating injuries. Cueball: Just go uphill. Don't stop, don't get stuck. You can make it. Cueball: I don't see anyone. I think the hills are empty. Megan: I wish we had time to explore them. I'd love to learn how they make all that stuff. Cueball: Is that the sea? Megan ...Should it be in view already? Cueball: I know this place. There definitely shouldn't be water here. Cueball: The sea must be following up old riverbeds. Megan: If it's here, it must be close to joining the river. How high up do you think we are? Cueball: No idea. How do you even measure that? Megan: Look at the spot where we crossed the riverbed. Cueball: I can't tell how deep it is. These things seem to be snaking in from all along the coast. We should've come from more inland. Megan: I was trying, but inland keeps moving! Cueball: They're headed this way. They must be planning to cross here. it's not actually a river; they can swim if they need. They're not here yet, and it's getting deeper. Better to get on their side while we can. Then we can help them back over if it's safe. definitely not while holding a bag. Megan: I guess the other sea is fresh water. I hope it's shallow enough to ford. Cueball: I'll go first, since you have the maps. Megan: I think this bag will keep them pretty dry if it has to. It's a good bag. Cueball: Whoa, careful-the current gets strong! Cueball: That was a little too close. Oh, they definitely see us! Megan: I think I can actually see it rising, at the edge. Megan: The sea is not going to stop rising! We have to get to the mountains! Friend: Where did you go? Megan: To the mountains! We learned everything! Megan: Most of it! Where's everyone else? Friend: The hills are empty! Friend: It's great! We don't have to wait for them to throw stuff away! A bunch of us are up there right now going through what they left behind! Friend 1: The kids told us about the sea a few days ago. I said we should move to the hills, but others wanted to keep clear in case the people return. Friend 2: There are twelve of us back at camp. Megan: ...we have to go back. I think there's stuff floating on the sea. Megan: We might be able to cross here, but the next group won't. The currents are strong and the water has changed. It's getting fresher, like a river. We can't float across, unless any of you can swim on fresh water. Friend 3: My cousin says she can swim across a river. Megan: Well, can she carry all of us? Friend 3: I'll ask her. Megan: There seem to be more of these channels. We shouldn't split the group up further just to get trapped among them. Friend 2: OK, what do we do? Cueball: I think there's something on the sea. Megan: We have to get everyone together. We have to find something to help us cross rivers and sea-channels. Megan: As you can tell, the sea is coming up the river. We need to get away from them, move along them on high ground to join up with the group in the hills, and then escape across the plains to the mountains. I have maps to show us the way. Cueball: To avoid being trapped by these sea-rivers-or the regular rivers-we need a way to cross them. Megan: They're too fresh to swim over, so we'll have to bring things to float with. They need to be light enough to carry, so wood won't work. Megan: Bags might work; some of them can hold air if they get wet. But grab whatever you can, we may already be too late. And the currents are strong, so we'll need rope. Friend 3: I found my cousin! So I made it into a boat! Most of the sand parts fell down. When it came loose I floated for a while. And then the sea pushed me up here. Beret Girl: I don't know how to stop! Friend 2: [Runs to get bags] Oh, um. Rope! Forget everything I just said. New plan. Megan: We're going to ride a raft up a river. But we have to work fast. Megan: The water is coming over the banks! This place is ending and it's time to go. Friend 2: This is really hard. we can sort of push back into the main channel. Megan: That's OK - you've done great. We're headed straight up the river channel! Megan: And we seem to be speeding up. Megan: Is there any way to keep us pointing forward? Cueball: We could start calling this the front. Friend C: Careful! Don't tip! Voice 1: What is that? Voice 2: Head toward them! Friend A: They're going to float past us. Can we push out into the current? Cueball: Who has the rope? Cueball: Careful! Slow and steady - don't break the rope! Friend B: We saw from the hills that the route back was washed out. So we found a raft and tried to get to you by the river. Friend C: But then the river started going backward and we got stuck. From crowd: Why is everything flooding? From crowd: Why is the water full of trees? From crowd: Why do you have little tables covered in sand? Cueball: What's our plan? How much time do you think we have to get across the plain? Megan: -No. None. I figured out some of the maps. If the sea is here, we're already cut off. There's nowhere else to run to. We're going to have to ride this out. Cueball (while climbing onto top platform): Yeah. Cueball (glancing over shoulder): ...Land! Megan: We've been heading right toward it since sunrise. Cueball: Land! Wake up, everybody! Front of boat: SCRAAAAAPE. CRUNCH. Cueball: Where do you think we are? Megan: But I bet we can figure it out. C'mon, let's see what's through here! Below is the list of all the frames of the comic, in the order that they were revealed. The given times denote the time since the comic was initially released on midnight, March 25, 2013, Eastern Daylight Saving Time (UTC - 0400). The following images show the faded images from day 36 with the fade removed. This page was last edited on 20 March 2019, at 12:17.